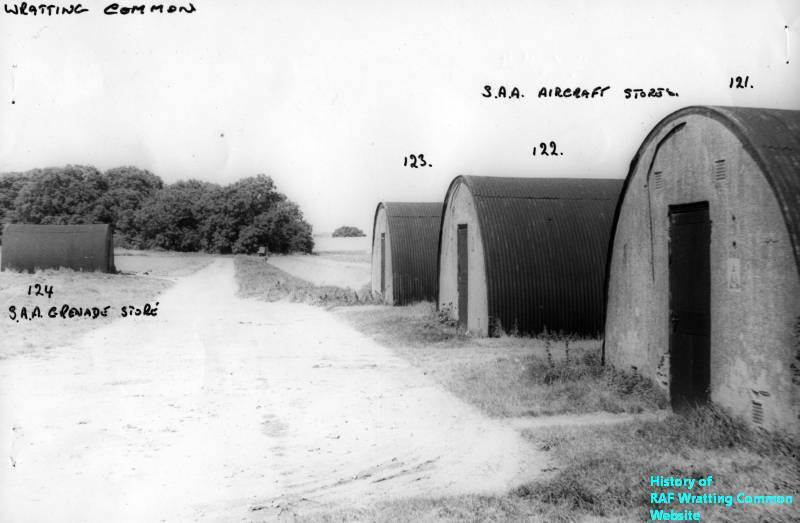 "Wratting Common airfield lies on the Cambridgeshire/Suffolk border 2 1/2 miles east-north-east of the village of West Wickham, after which it was originally named, and 3 3/4, miles north-north-west of Haverhill, the nearest sizeable town. The airfield site, at an elevation of 398 feet above sea level, is on a plateau slightly higher than the surrounding countryside. On the airfield itself a conventional triangle of three concrete runways with chip surfacing was provided. The longest, at 6000 feet, was runway 13/31, and the supplementary runways were 02/20 and 07/25, both 4200 feet long. The ends of the runways were joined by a standard 50-foot wide perimeter track, along which were built spectacle-type hard standings for 36 heavy bombers. Hangarage was unusually generous - four standard utility T2 type and one B1 type hangars stood on the north and west sides of the airfield, each with a parking apron. On the south side of the airfield an extensive bomb dump was laid out, complete with fusing point buildings, pyrotechnic stores and grenade stores, with a lengthy system of connecting roads. Somewhat unusually, the airfield control complex was built well within the perimeter track on the north side of the airfield. The control tower itself, Building 71, was of a standard design (12779/41), and close by was a radar workshop, a tractor and trailer shed, night-flying equipment store, fire tender shelter, signals apparatus building, RDF workshop and pyrotechnic store. 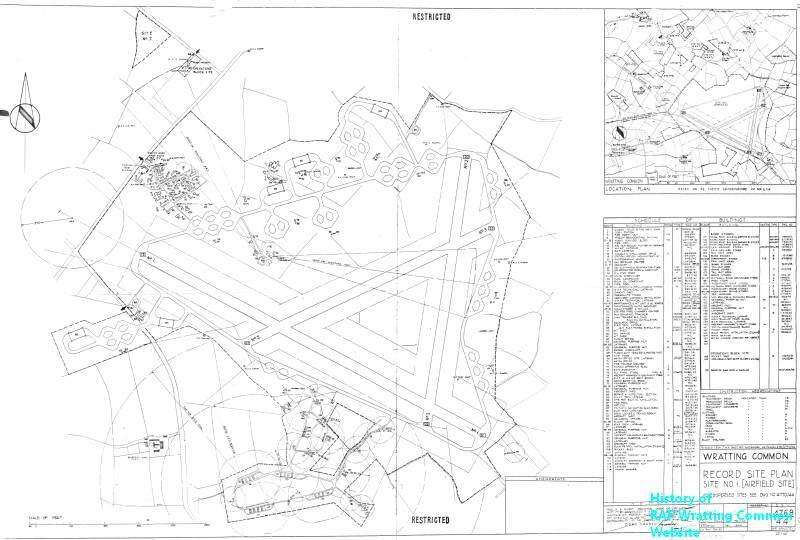 The main administrative site at Wratting Common was on the northwest corner of the airfield, with access from the Brinkley to West Wickham road through Weston Woods Farm. Here with the inevitable guardroom on the left as one entered the site, were the Station Headquarters building, signals section, armoury, crew rest rooms, MT section, link trainer building, dinghy shed, main workshops, main stores and mainly other buildings. Two anti-aircraft gun posts manned by the RAF Regiment were installed for the defence of this area. At a distance of about 700 yards from the Administrative Site, on the road to Weston Colville, stood the Operations Block and Briefing Room, built to drawing 13023/41. Along the same road was Site No. 2, the main communal site; here were such buildings as the Sergeants' Mess for 550 men, the Officers' Mess for 175, the education block, a combined gymnasium and chapel, squash court, ration store, the CO's quarters, a barber shop, the post office and two NAAFIs. Accessible through Site No. 2 along concrete roads were Sites Nos. 5 and 6, which comprised living accommodation. Between Site No. 2 and the Operations Block was Site No. 7, another living site. At Whiting Grove, opposite Site No. 2, more domestic accommodation was located on Site No. 4, and, divided by College Grove, were the two WAAF domestic areas; Site No. 10 was small, but Site No. 11 contained dining rooms, a NAAFI and accommodation for all ranks of WAAF. 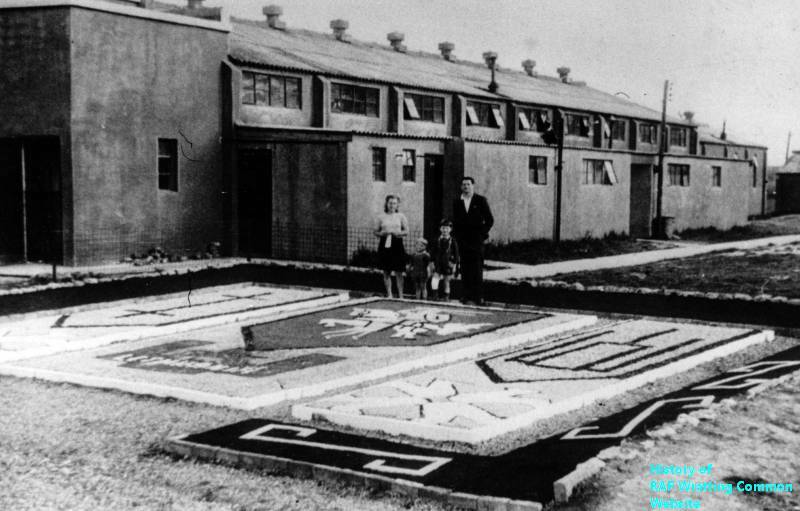 Yet more living accommodation for airmen was located at Carlton Green on Sites Nos. 8 and 9. Finally, but not the least important, Site No. 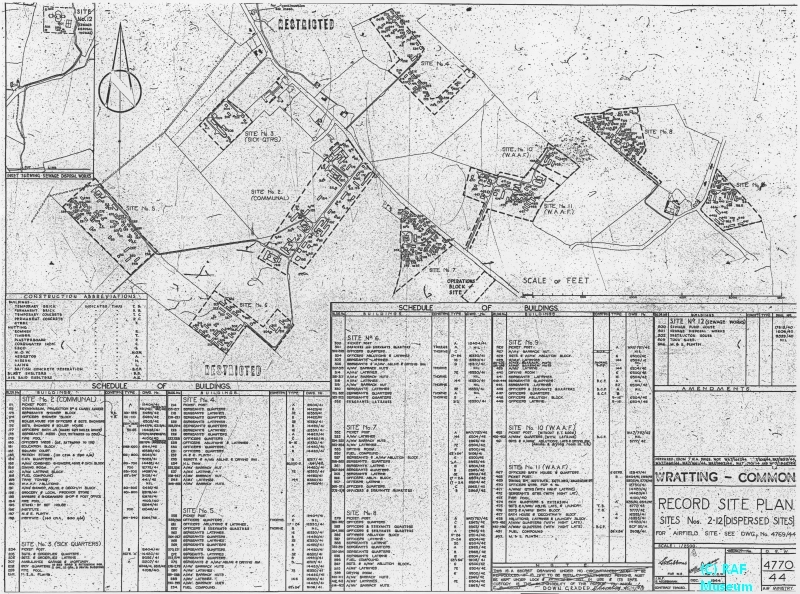 3, the Sick Quarters site, which contained a hospital ward, mortuary and ambulance garage, was situated almost in Weston Green village, and Site No. 12, the sewage disposal works, was on the other side of Weston Green. A passer-by today should certainly realise that an airfield once existed at Wratting Common, as quite a number of buildings still stand on the airfield site, the most obvious being two of the T2 type hangars and the B1 hangar, on the West side of the Haverhill road, which are in use for agricultural purposes. Close to the T2 hangar alongside the same road are two large Nissen huts, Building 158, the Maintenance Store block, and Building 161, the Station Maintenance block, both in an advanced stage of disrepair. On the Technical site, Building 60, the MT Office, Building 61, the MT Shed, and Building 41, crew rest rooms and locker rooms, are still standing, while on the South side of the airfield, on the bomb dump, two firing point buildings and five other small bomb and grenade stores can be seen. Away from the airfield, hardly anything can be seen on the old dispersed sites. On Site No. 2 a blast shelter near the entrance is visible, but otherwise only the beginnings of the concrete entrance roads to the various sites still exist. There are no other clues to indicate that here, in these green fields, hundreds of men and women lived and worked in a concerted effort to overcome a terrible threat to our way of life."